My favourite season is here! Even though I love summer, fall is my favourite. My birthday is just around the corner and the cooler temperatures makes it so much easier to layer your clothes, which is such a nice styling opportunity. Like I talked about here, I like to keep a ‘wishlist’, so I only buy what I’m missing in my wardrobe. 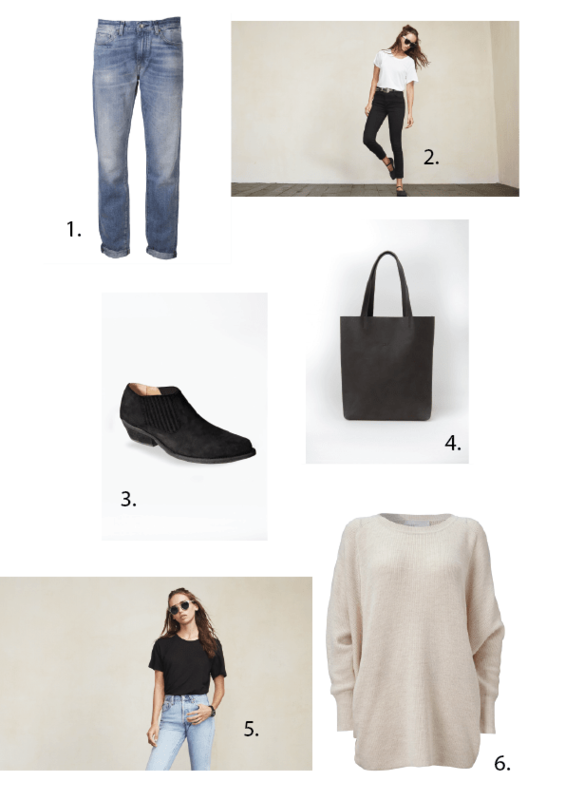 The change in season is the perfect time to update it and focus the shopping on fall-appropriate items. This season I’m looking to update my wardrobe with few good quality pieces, like a pair of Levi’s and an AIAYU sweater. I have looked for a pair of loose fitted jeans in a really long time. Making jeans is very labour- and water intensive, especially in a light wash like these ones, so I wanted to find the best option possible. I’ve looked at flea markets and secondhand shops to find secondhand ones and I’ve researched to find the best sustainable option out there. Coming up empty finding a pair that met both my sustainable and fashion demands I turned to Levi’s. The oldest jeans company in the world must know a thing a two about making good jeans. These ones are probably not the most sustainable choice, but they are made out of 100% cotton, making them easy recyclable, they’re produced in Turkey and Levi’s is almost synonym with good, longlasting quality. This time fashion definitely beat sustainability, but like I talked about here, only adding things you really love to your wardrobe will always be the most sustainable choice, and I’m hoping lots and lots of wears in years to come will make these jeans the right choice for me. The AIAYU sweater comes in a variety of colors, I’m going to choose a classic light color, which will last me season after season. The brand’s designs, their philosophy and the production methods are amazing and I can’t wait to get my hands on one of their sweaters, I think this one is going to be a fall essential. Read more about AIAYU in my brand feature here. I also need a new bag for my laptop and everyday essentials, which I’m currently carrying around in a canvas tote that looks as if it’ll fall about any minute due to the weight of stuff I put in it. The black leather tote bag from Dutch brand PUC would have been the perfect fit if only it was a bit bigger. PUC creates contemporary classic bags using off cuts of Europe’s finest leather that would otherwise go to waste. PUC stands for Personalised Unique Collection as the leather from each bag has it’s own character, which is part of the bags beauty. Each bag is hand made with love and attention to detail making every bag unique. If only I can find an alternative that looks exactly like this, but in a size that I could fit my laptop into. A pair of black ankle boots have been on my wishlist for soooo long and it seems almost impossible to find the perfect pair. These ones from French brand Good Guys might be the solution. Like I’ve talked about here I still think leather is a great quality material, but finding alternatives is definitely something I’m looking into. Good Guys was created by former Isabel Marant footwear designer Marion Hanania after struggling to find good quality, stylish shoes that use non leather to suit her vegan lifestyle. Additionally, all materials are waterproof, non toxic, breathable, durable and light plus they can be cleaned to look as good as new with soap and water. Last but not least I need some new tees and I love Reformation’s Dan Tee. It comes in five different colors and I’m adding a black and a white to my wardrobe as soon as they’re back in stock in my size. I love how the design is inspired by men’s clothes and the crew neck, short sleeve, and sheer lightweight jersey fabric make it the perfect basic in my wardrobe. Additionally, it’s produced in 100% tencel, which is one of the most sustainable materials out there. What’s on your fall wishlist?